Imagine for a moment what the economic impact would be if the Canadian and American governments became serious about dealing with pollution and climate change and banned the manufacture of new cars and trucks immediately. We would simply not make them any more. You could continue to own the one you have, but no new parts would be made either, so once they ran out, that was it. What would happen to our economy if this were to happen? Well, that’s about the size of the impact of the slave trade in Britain and her colonies in the Americas a little over 200 years ago. There were very few sectors of the British economy that did not directly or indirectly rely on the use of slave labour. It was for this reason the British Parliament had resisted all previous efforts to curtail the trade. Then along came a man named Wilberforce. Not wanting to get involved in the family business he sought out a seat in Parliament, and in 1780, succeeded in being elected as the Member of Parliament for the county of Yorkshire. At first his political career looked a lot like his academic one. He later admitted, "The first years in Parliament I did nothing—nothing to any purpose. My own distinction was my darling object." At Easter of 1786 however, he had a spiritual awakening and, determined that his life should not be without purpose, he decided to champion the cause of those who lived at the opposite end of the economy to himself – the slaves. He had been greatly influenced by the work of one, Thomas Clarkson, who had written a pamphlet entitled “The Impolicy of the African Slave Trade” which had been widely distributed. Wilberforce tabled his first bill seeking the abolition of the slave trade in April of 1791. It was defeated 163 votes to 88, but William, undaunted, continued tabling a new bill in ever single session of Parliament. He came close to succeeding for the first time in March of 1796, when all indications were that the bill would succeed by at least a dozen votes. His opponents however, took advantage of the premier of a new opera on the night of the vote, sending free tickets to Wilberforce’s softest supporters. They used the tickets and the bill was defeated 74 to 70. Finally, a bill calling for the abolition of the slave trade was introduced to the House of Lords (the inspiration for the Canadian senate) by Lord Grenville, a supporter of Wilberforce’s. His impassioned speech called the Upper House to account for it’s reprehensible conduct in allowing such an abominable industry to continue. To everyone’s surprise, the bill was passed by a vote of 41 to 20. This sent the bill to the House of Commons for a vote, where member after member called for the bill to be passed, praising Wilberforce for his 20 year campaign to end the slave trade. Finally, at 4:00 a.m. the vote was taken. The bill was passed by an overwhelming vote of 283 to 16. One month later it was given royal assent and became law throughout the British Empire. While the bill only banned the trading of slaves by British companies or on British ships and not the owning of slaves itself, it marked the beginning of the end for the slave trade between Africa and the American continent. Canada banned slavery completely three years later in 1810; but it would not be until 1833, just three days before his death, that an ailing Wilberforce would receive word that all of Britain’s slaves had finally won their freedom. The slave trade in America came to an end in 1863. William Wilberforce was buried in Westminster Abbey on August 3rd, 1833. The funeral was attended by many members from both the House of Commons and the House of Lords, as well as many members of the public. The pall bearers included such noted men as the Lord Chancellor and the Duke of Gloucester. 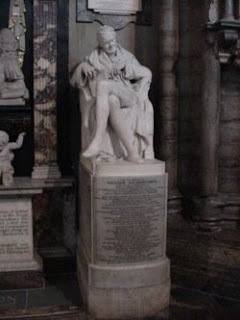 In 1840 a memorial (pictured) was erected in the north choir aisle of the abbey. The legacy of William Wilberforce is not just the end of slavery in the British Empire, it is also the notion that one man, with his heart in the right place and God on his side, can make a difference in how the world works. He demonstrated that it is possible, however unlikely, for the Kingdom of Heaven to be lived out in the real world if we have the will and determination to see it happen. That fateful vote in the House of Commons, began on the evening of February 23rd, 1807 — 200 years ago this week. February 18, 1678 - "Pilgrim's Progress" is published for the first time, in England. The author, John Bunyan, spent a total of twelve years imprisoned for preaching without a license contrary to the rules of the Established Church. It was during this times, between 1660 and 1672, that Bunyan conceived the ideas that he would eventually turn into this masterpiece of Christian literature. February 19, 843 - Empress Theodora, at the request of a Council in Constantinople, reinstates icons once and for all in the Eastern churches, effectively ending the medieval iconoclastic controversy. A similar Council had allowed the use of icons back in 787, but opponents of these images still controlled much of both the government and the church leadership. The controversy did not end there, however, and is cited as one of the reasons for the Great Schism between Catholics and the Orthodox in 1054. February 20, 1895 - Frederick Douglass, the first African-American to hold high political office, serving as an adviser to President Abraham Lincoln during the Civil War, dies in Washington, D.C. After escaping to freedom in 1838, he became the most prominent black abolitionist touring the country to rouse support for the movement. In his speeches he often criticized the "Christianity of this land," for tolerating slavery, considering himself a devotee of "the pure, peaceable, and impartial Christianity of Christ". February 21, 1945 - Eric Liddell, the Scottish Olympic runner whose story is told in the film Chariots of Fire, dies of a brain tumor. In 1925, he joined the staff of the Anglo-Chinese Christian College in his birthplace - Tientsin, China. Captured by the Japanese in 1942, he died just before he was scheduled to be released. February 22, 1906: Itinerant evangelist William J. Seymour arrives in Los Angeles to lead a Holiness mission (an interdenominational group planted to evangelize an area). The group grew larger as word spread of its revival meetings and the fact that “speaking in tongues” was a regular occurrence. Eventually, they moved to a rundown building located at 312 Azusa Street. Later on, the famed "Azusa Street Revival" broke out under Seymour's leadership. It was one of the pioneering events in the history of 20th century Pentecostalism. February 24, 1582: Pope Gregory XIII issues a bull (a type of holy edict) requiring all Catholic countries to follow October 4 with October 15 and replace the Julian calendar with the Gregorian (named for the pontiff and which we still use today). By this time, the Julian calendar had drifted from the equinoxes by a full ten days, and so a new calendar had been devised. In some communities where education was not readily available there were protests of the action as some believed the church was robbing them of 10 days of their lives.